So last week or so I brought home the library haul. Five books, three of which I read completely, one of which I got 2/3rds through, and one that went back without really getting started. Then I hit the Raven Bookstore with a holiday giftcard for more bookloot. These are the results. Not a surprise that I really enjoyed The Guilty Dead, the ninth Monkeewrench outing. I skipped book 8 somehow, but each of these novels is pretty much standalone. One of the things I most like about this series is that even as the mysteries build to super high stakes, each step feels plausible. The characters are believable in their context. My favorite of the series is still probably The Sixth Idea, but this is a good entry. I understand that PJ Tracy is a solo act now after the death of her mother, but she’s doing her mom proud. Recommended for mystery lovers. 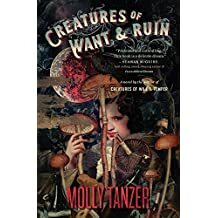 I went back and forth on whether I was enjoying Creatures of Want & Ruin, by Molly Tanzer and in the end, the exceptional and out of the ordinary, characterization, demonology, and setting made this a win. Her books aren’t always paced the way I’d like, but they always make me feel rewarded for reading them. I’m looking forward to more in this world. Recommended. Pop the Clutch! This is an anthology I picked up on a whim, despite not having any particular interest in Rockabilly culture. And the book had some formatting/editing issues that really irked me–splash pages of art left blank with <IMAGE PENDING> left behind; stories that repeated a sentence twice, the constant misspelling of “altar”. But crankiness aside, there were some gems of stories in here. I really enjoyed “Tremble” by Kasey and Joe Lansdale about a singer with a grudge; “Dr. Morbismo’s InsaniTERRORium Horror Show” by Lisa Morton about schlock horror shows running into a real ghost; and “I Was a Teenage Shroom Fiend” by Brian Hodge which has them all beat for pleasantly weird. Priest of Bones by Peter McLean. How many times am I going to check this book out before I finally finish it?!? At least one more. The deal is that somehow, despite McLean’s great writing, and treading the sweet spot between “gritty” and “nihilistic”, and me being invested in the characters, I just keep hitting a wall. This time, I got through the entire first act, much of the second, and well… I’m not as interested in the turn the book makes toward politics. Add in the fact that it’s not a stand-alone, and I lose momentum. I’m still going to recommend it though because it’s really well-written! And really compelling! And I’m going to check it out again. Recommended. Kill the Queen by Jennifer Estep. A DNF. Really, more of a DNStart. I blame the blurb. It told me too much of the exciting event to happen, so that I started the book on a mental timer, waiting for the slaughter to begin. And instead, I got a slow build, where the heroine notes all these “odd” things going on in the palace, but doesn’t draw any conclusion–which annoyed me, because I already knew what the conclusion was: SLAUGHTER!!! I was impatient and not in the mood. I sent it back to the library. It looks like it might be a lot of fun for the right reader. That’s apparently not me. Picked up two mysteries at the local bookstore, one of which I disliked immensely because I thought the heroine and her family were horrible stuck-up snobs. Her sister met her fiance… ON THE INTERNET!!!! The Horror!!! And it tried really hard for quirky cast of characters but mostly just felt crowded and full of people I would hate to be around. Not going to name it. But it was one of those cozies that require the mystery to stop while the “gimmick” is run through. In this case, every meal involved a long description of the cooking process. Which, really, was maybe my favorite part? But… if I want to read about cooking, there are other books with that as the actual focus. 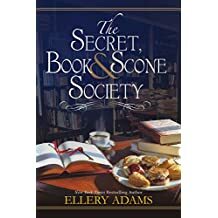 The Secret, Book, & Scone Society by Ellery Adams on the other hand was pretty good. It’s a little artsy for my taste in some places–the four women sharing their “dreadful” secrets and handing out secret keys, and the like–but in the end, I really liked these characters and would gladly read another book in the series. 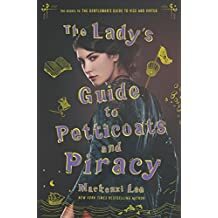 Though I never read A Gentleman’s Guide to Vice & Virtue, that didn’t stop me from picking up the second book in the series, The Lady’s Guide to Petticoats & Piracy. I felt comfortable doing this since it revolved around a secondary character from the first book as this book’s protagonist. And I’m always up for reading about a determined girl trying to break down the rules of society that get in her way. Things I really appreciated about this book? Multiple female characters, all fighting for their futures in their own ways, and learning to respect each other’s choices. That’s before you get to having an Ace protagonist, which is always refreshing. My only hiccup was that I was reading along assuming this was pretty much basic historical YA and suddenly there were magical dragon scales. So that sort of took me aback. Not badly, just a bit of blinking and wondering how MacKenzi Lee managed to convince the publishers to go for that! And a personal fail. I bought a book I already owned. God, I hate that. A lot. At least it was a good book! A Treacherous Curse, book 3 of the Veronica Speedwell mysteries by Deanna Raybourn. I would recommend this series for anyone who loved the Amelia Peabody books by Elizabeth Peters. It’s that awkward time of the year where we’re careening between holidays and the dreaded LIBRARY CLOSURES. It’s not like I’m not surfeited with books in my house, but the very idea of a holiday without any library books to hand is… alarming. 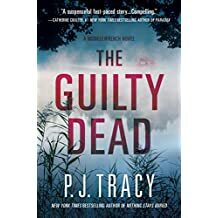 PJ Tracy’s The Guilty Dead, which is a Monkeewrench mystery. This is a strange series for me. Some of them are excellent. Some of them are tragic. And some of them just sort of misfire. The authors seem to cram other types of genre into their mystery so each book can be a pretty different reading experience. Creatures of Want & Ruin by Molly Tanzer. The title made me think it was a sequel to Creatures of Will & Temper, which I quite liked. But if so, it’s a sequel by setting, rather than protagonist. That’s all right by me. Hopefully, this one the dog won’t eat. I had to buy the first book from the library after the puppy got hold of it. 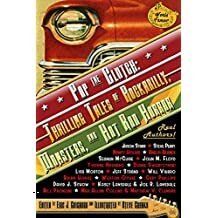 Pop the Clutch: Thrilling Tales of Rockabilly, Monsters, and Hot Rod Horrors. Totally not my kind of book, but hey it fell off the shelf that I was browsing and it’s a library–it costs me nothing to give it a try (unless the dog gets involved). So I took it home. 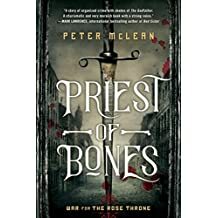 Priest of Bones by Peter McLean. Technically, I have borrowed this book before. But, I had just cracked it open, decided I really liked the voice of the book, when it came due. The downsides to quickly browsing the “new releases” shelves when I’m in a hurry. It was back; I am going to read this one first this time. Seems like it’s going to do the difficult work of treading the path between “gritty” (bleh!) and “realism” well. 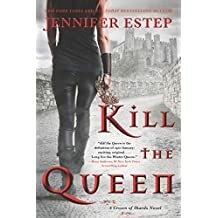 Kill the Queen by Jennifer Estep. Long ago, I bought Spider’s Bite, but never got around to reading it and misplaced it. It’s here. Somewhere. In one of the book piles. But for now, the idea of an epic fantasy with a modern urban fantasy sensibility seemed deeply appealing. Also picked up: Rick Springfield’s newest CD The Snake King. (The man is STILL MAKING MUSIC! Is it any good? I will find out!) And Camila Cabello’s self-titled CD. I like the “Havana” song. It’s catchy. Removing any of these layers tends to send me scrambling, shivering, for a cover in the middle of the night. It’s four loads of laundry. It’s endless treks up and down the stairs. It’s another reason I contemplate moving to sunnier, warmer climes every December. It’s hard to remember that when I was a kid in Miami, snow and cold seemed… magical. From Narnia’s endless winter, to all the Christmas songs, to the fashionable accoutrements–boots and nifty jackets and big chunky cable knit sweaters. The closest thing we got to snow in Miami was the rich girl’s birthday party, where her parents bought snow and covered their front yard with it. Or the iceberg in the NOAA museum. Or that one weirdly magical day where teeny tiny flakes swirled out from the sky for a whole five minutes, and we all shivered and went inside for hot cocoa. I spent so much of my childhood dreaming of snow, and now, I spend winter nights under my layers and layers of blankets, socks on my feet, dreaming of sand and sun. I could say it’s human nature to be discontent with the status quo, but I think it’s simpler than that. I’m stuck in my own fairy tale: The Girl Who Couldn’t Thermo-Regulate. Sometimes I don’t understand how certain events happen, even when I’m the one making the choices. I started a late breakfast this morning with two slices of toast; the toaster rattled angrily, did its best to char the toast, then as a final FU, flipped the toast onto the floor… where the small schnauzer ate it. That’s all right; one of those slices was for him, anyway. But I didn’t feel like dealing with the angry toaster again, so I stuck a croissant into the oven to warm up. Then I forgot about it, until the thought crossed my mind, that hey, I was hungry, wasn’t I making breakfast? And turned around to see the black smoke STREAMING out of the oven vents. Opening the oven revealed the croissant was on fire. Yay. Some foods are great with a flambe. Croissants, not so much. The usual dither ensued: what do you do with the giant flaming smoking thing to a) keep the smoke alarm from going off and b) stop the fire. I grabbed the pan, opened the back door, and flung the flaming croissant through the air. Jeffrey, the small schnauzer, and Ursula, the… adorable dog thing, nearly kneecapped me racing out to CATCH THE FLAMING CROISSANT! Jeffrey is a schnauzer! He has a beard! That should not catch on fire! Cue panic. While still holding the scalding pan, and smoke filling the room, and the cats deciding maybe they should rush outside also…. In the end, the hot pan went into the doggy dig pit (full of sand and snow melt); the cats got shoved inside (full of indignation); and Jeffrey grabbed the flaming croissant, and QUICKLY dumped it into a mud puddle. Then he ate it. This dog needs grooming. LOOK AT ALL THE FLUFF THAT COULD HAVE CAUGHT ON FIRE!!!! No one is on fire. And the smoke alarm did not go off. Jeffrey does not seem to be suffering from a stomach ache. I’m taking it as a vaguely embarrassing win. And a sign that my great plans for baking Sand Tarts/writing complicated confrontation scenes in the novel at the same time are not a “go”. No multi-tasking for me, today. At least… not before a LOT more coffee. Sometimes it becomes apparent that what bonds you and your siblings is not just blood, or experience, but shared crazy. Apropos of nothing, my baby brother texted me a picture of a fork. Labeled it THE ONE FORK. And with this text. BTW: this is the ONE fork. It came from the house of Robins. I can find no other like it. To clone it is my Xmas wish. I agreed instantly! I had TWO of those forks. And this is how I know I’m not a selfless big sister. He asked me if he could have one…. One of my TWO?!?! Obviously, desperate measures had to be taken. Whipped out the research gene, and lo and behold, the forks are still available! Used, of course, and randomly spread across internet auction sites like eBay, etc. But there they were! The ONE TRUE FORK! OUR PRECIOUS!! I sent him the link. And then decided, hey, two of these forks were nice, but more? More would be better! El Niño came to the same immediate conclusion. The texting lapsed. It lapsed… suspiciously. Pretty much the length of time it took each of us to find our wallets, our credit cards, and start shopping. Cue a buying spree in two states in two time zones. I purchased six more of The One Fork! My brother, losing his mind with excitement, purchased about five forks, two random knives, and a bunch of teaspoons, all in the same pattern. The thing you have to understand is that this is a cheap fork. It’s not like we were losing our minds over missing pieces of Granny’s sterling. No, this is a stainless steel fork that is about one step up from a durable plastic fork. It’s EKCO brand, which is about as inexpensive as you can get and still have the flatware not bend with use. It’s not a particularly exciting pattern. A basic chevron with a couple of random swirl dots at the end. We don’t even know where these forks came from: our mother denies all knowledge of them, and in fact has been known to sneer at them. So why, oh why, do we love this particular fork so much? It’s lightweight and it pierces everything you poke it at. You can eat a salad with it and stab a crouton right through the middle without the crouton crumbling! And if you’re missing a steak knife, well, hell the sides of the fork are thin and sharp enough you can use it to cut with. These forks (3 of them exist for sure, and we may have to poll the other brother to see if he has any of them) survive everything. They are the first forks we reach for. They are the ONE TRUE FORK. Even my roommate agrees. It happened organically. I have two of the forks. One of them is always in the dishwasher. And then, I realized, we were both subtly jockeying for the Stabby Fork at every meal. Ignoring all the “good” forks. It’s a mark of favor when one of us steps back and serves the other with the One Fork. I can’t explain it. I don’t really know that I can even blame it on nostalgia. But, at least I’m not alone. And now, I have more of THE ONE TRUE FORK. They’re perfect. They’re the exact same fork, only lots shinier. And I think I’m going back for the teaspoons. Why? Because they’re stabby at the tip. AKA things that I have been up to. Preparing for the holiday cookie siege. I made chocolate chips, and gingersnaps, and following Sally’s Baking Addiction recommendation, froze most of them in little raw balls of dough ready to be baked. I always forget how much I love doing that. You can freeze cookies for later (as long as the fat content is high and you wrap them well), but nothing really beats yanking out a half dozen cookies and having them bake up fresh whenever you want a treat. I really always mean to do this year ’round and forget. Someday I will treat puff pastry with the respect it deserves. But this was not that week. My roommate cooked up a bunch of local apples with cinnamon and butter and cloves and I bunged a bunch of them into the world’s most haphazard puff pastry wrapping. They kind of looked like softballs caught mid-explosion, but tasted delicious. And while I was at it, I used up the nutella to make puff pastry pockets. I would have used lemon curd, but tragically, it had gone bad. And reading. I read a lot but every so often I lose it and go on reading binges. Usually when I find a new-to-me author who has not only an enjoyable book, but an entire backlisk. So Clara Coulson. Yeah. Her books are urban fantasy fun, and I devoured pretty much all of them between the 9th and the 15th. That’s three of the Frost Arcana, five of the City of Crows, and one stand-alone Lark Nation novel. Just a heck of a lot of fun, though I’d say the Frost Arcana are probably the best entry points. Cal Kinsey in the City of Crows takes a little getting used to. If he were a heroine, they’d be lining up to call him a Mary Sue. Mostly Clara Coulson scratches the same itch that Mercedes Lackey used to. I can’t wait for more of her books! If you like adventure based urban fantasy with a surprising amount of super-violent action and great fantasy elements, this series might be for you! Seriously. After a celtic fantasy binge that lasted through most of high school, I was kind of burned out on the seelie/unseelie/sidhe/tuatha de danaan mythos. These books make it all feel fresh again. Writing. Ffs. I’m about six thousand words into Book 2 of the fantasy series and sort of stopped working on it. There are reasons (decent ones), but primarily it comes down to lack of organization. Life gets busier and busier in the fall and I need to take steps to make it easy to sneak a few hundred words here and there. It’s easy to get hooked into the crutch of the perfectly set up desk with all your note files and scrivener and the white boards full of maps and the walls full of setting pictures and character images, but when you do, you find yourself thinking oh, wish I could work, but so-sad, I’m out of the office, and not near my desk. So, I’m trying something sensible and slightly new. Setting up the next scene and tossing those few paragraphs into google docs so I can access it while at the day job, or out and about. I can read the plan on the phone and write on paper, or I can read it on a desktop and write directly into g docs. Failing everything else, at least I can keep thinking about where I want to go in the scene! And a snippet of what I was last working on. Genee had made sure she knew exactly where to find her. Sianan Maccuin jerked to attention when Genee melted out of the stairwell’s shadows and Genee made another mental note: More light. GreenStone Hall was as dark as a tomb. Genee waited. Sianan had a sneaky habit of talking in questions, letting people fill in the gaps. She learned more than she should that way. But she wasn’t supposed to apply that to her commander.